A column is a very important component in a structure. It is like the legs on which a structure stands. It is designed to resist axial and lateral forces and transfer them safely to the footings in the ground. You can manually calculate the superimposed loads on a column in a structure using a simple process outlined in this linked article. Columns support floors in a structure. Slabs and beams transfer the stresses to the columns. So, it is important to design strong columns. A column is defined as a compression member, the effective length of which exceeds three times the least lateral dimension. Compression members whose lengths do not exceed three times the least lateral dimension, may be made of plain concrete. Please see the link for formulas to calculate axial loads in columns. I would recommend using advanced structural design software like ETabs or Staad Pro for design of structures. Column design does not depend only on axial loads, but also on many other factors. There are bending moments and tortional forces induced due to beam spans, wind loads, seismic loads, point loads and many other factors. In this article, we are going to discuss in detail the basis of classification of columns and different types of reinforcement required for a certain type of column. The ratio of the effective length of a column to the least radius of gyration of its cross section is called the slenderness ratio. Minimum area of cross-section of longitudinal bars must be atleast 0.8% of gross section area of the column. Maximum area of cross-section of longitudinal bars must not exceed 6% of the gross cross-section area of the column. The bars should not be less than 12mm in diameter. Minimum number of longitudinal bars must be four in rectangular column and 6 in circular column. Spacing of longitudinal bars measures along the periphery of a column should not exceed 300mm. It maybe in the form of lateral ties or spirals. The diameter of the lateral ties should not be less than 1/4th of the diameter of the largest longitudinal bar and in no case less than 6mm. The diameter of helical bars should not be less than 1/4th the diameter of largest longitudinal and not less than 6mm. easy to understand for design of columns thanks for information. I am buildin an office space c to c measurements are more than 26 feet .the central column is planned as 2×2 .i asked my engineer to consider 1×4 column instead. There is no such thing as thumb rules…You must see a civil engineer if you want to get a structure designed. Structural engineering is a 4 year course. People work hard to become good civil engineers. If there were thumb rules for designing structures, we wouldn’t need Civil Engineers. Of course you must have found a contractor who would advise you that you dont need a civil engineer but trust me the building quality will be absolutely disastrous. You build a house once in a lifetime, invest wisely. Get experts involved. Your dream house should not look like a piece of trash. You want to live in a beautiful house and praise it every single day of your life. I have one question ………. my question is what is the meaning of cover from main bar ? if answer is center of bar to surface of concrete then where it is mention or if answer is face of main bar to surface of bar then where it is mention. Can any one help me by giving me what distance of longitudinal bar to surface of lateral concrete surface should have to follow? I mean is there any rules for length and width of ties? 2. Filling the full column at a time. Secondly, in such case what should be distance between columns and how deep should the beam be. Structural design is never done on assumptions. It requires professional knowledge which comes only after you have studied and practiced engineering for a while. I suggest that you should stop assuming the column sizes with regards to plot area. The size of the column depends on the plan of the structure. It also depends on the height of the building. You can seek professional advise with regards to structural design from the experts at Civil Projects online. ur details v.good for civil projects and for the student of civil engee. Always happyness for u and all human. very very good explainatory guidelin for me, very much thanks to you. i would like to ask if a RC column designed as 500mm x 700mm x 7000mm (H). After striked formwork, we found that the size casted was 500mm x 690mm x 7000mm (H), are there has any problem to column strength. concrete cover is 40mm from main bar to concrete surface are achieved during inspection. ….Can you please tell me,(a room 12’x14′,height 12′, in a normal house construction,ground floor and first floor,what should be the size of pillars?,can you please help me out,my house is under construction. Hello i read all design ,always upload design with the help of a example. 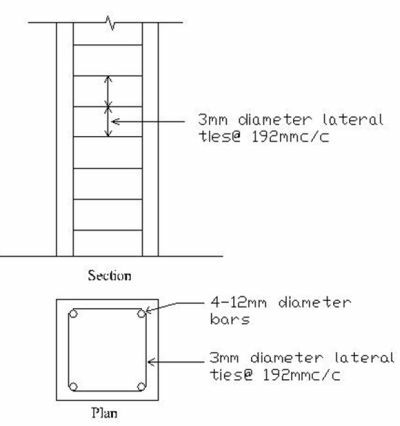 …sir/ma’am how about the close spacing of lateral ties of column near the beam-column joints any rule of thumb or code specs.? cause what i have only knew is that frm code: not to exceed 48 tie dia.,16 bar dia. or least dim. cause as what i have always observed or seen in the actual there is always that close-spacing near the joints/supports. plz need reply, nd thank you & more powers.. .
wawo awesome……….it’s a simple and perfect answer that i was searching. thank you civilprojectsonline.com for helping me. i need an example on design of Long Column..
After reading what you do i thought it will be nice to do business with you,there is a piece of land in Cameroon were we intend to construct a tall building for commercial purpose and will like if you can help give me advice on what to do. Thanks in advance. Give me the idea about retrofiting of RCC column. How does the shot column negativ affect can be reduced in RCC building. Thanks for sharing your precious knowledge with us but appreciate more if u give us equational form of column design pattern with some illustrated problems.Hope my comment is clear.Thanks once more. Thank you for the comment. Will definitely try and put up some numericals illustrating the RCC column design. is any book to clear the basics of structure.. I really admire engineer’s brilliant ideas. How they could come up with a solution which is in the context of applied science and mathematics. its deeply, easily, simply giving good information…? Very good explaination of terms. Keep it up. Also give the information in the lines of loading ..
Design of various type of columns may kindly be provided under various condition of loading. an example of axially and biaxial loaded column may kindly be sent. this id simple and easy to understand.but the i coudnt found the topic of “how to design column” as said above.THank u.
I like your details. But I not found any design problem with solution by equations. If you please mentioned some design problems then the topic “Design of Column” will be completed. Thanks. Very clear Information which I read & easy to understand and I think it will benificial to increase my knowledge, Thank you very much.